Rounding out our selection of tools available to borrow is a whole category of Canning, Preserving & Homebrew tools. 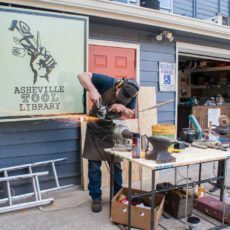 One of the goals of the Asheville Tool Library is to empower our members with the tools you need to be self sufficient. From garden to table, we have all the tools you need to grow and preserve your own food. This 23-quart stainless steel pressure canner is a complete 7-piece canning kit including: jar lifter, lid lifter, funnels, thongs, etc. It also has an extra tray for two-level canning. This is not dishwasher safe. Rubber seal must be cleaned after use. Manual is included with the canner for reference (so be sure to return it for the next AVLTL member).